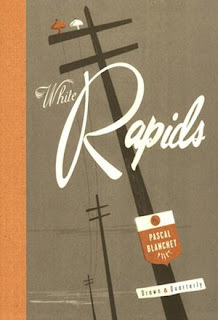 White Rapids is a short, bold graphic work by young Quebec illustrator Pascal Blanchet, translated from French. Blanchet's interests are obvious from the outset: Architecture and mid-20th century graphic design. His 1950s palette is subtle, warm and consistent throughout, but styles mix and blend - some Googie swash here, Deco there, Streamline Moderne - though all with bold flat and architectural shapes. Blanchet wants to tell the story of the rise and fall of a company town in remote Quebec. A common story in Canada, this one is unusual in that it is not a mining community, but rather a community built around a hydroelectric project. Founded in the late 1920s (see excerpt for lovely 20s Deco), peaking after the war, the town is then automated into obsolescence in the 1970s. He does tell this story, but only the lightest wisp of it - the bare essentials. There are no characters1, only scenery, which is sometimes peppered with figures. But the scenery! Blanchet is a master with the architectural details, with perfectly coloured bevel and shadow. His set pieces are brooding, wistful and exciting, with a dynamic perspective. There is a story here to be told in just the architecture. 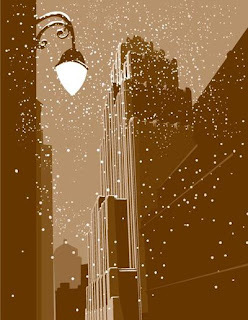 The work starts with the dramatic deco lines and early 20th century offsets of the Aldred building in Montreal2, but tries to manufacture a matching suspense and drama in the narrative that doesn't make any sense to me. Then we have the dam at the centre of the story, with a sense of tension and release that made me need to use the washroom. And then the buildings in the town, pulsing and murmuring away - then later empty but not consumed, warm and with a sense of dust. All perfectly vibrant and powerful, despite the muted palatte. Just as the drama at the beginning of the story rings false, the drama at the end is thin and twee. In the middle, there is some sort of sing-a-long tour of the town and its surroundings which I think is intended to stitch together various views, but which instead distracted me from the views. Part of the problem here is that this is a graphic novel but not "comic" style - there are no panel divisions, and no convention of word balloons to lean on to structure the text. Full page and full spread artwork without divides and borders is perfect for his style, but he hasn't figured out how to integrate text. My inclination is that he simply shouldn't have - it consistently distracted from the work. Or perhaps I want him to delete all of the text to rid this work of its most painful aspect, the monumentally bad use of font. Each page has a distracting new font wedged into the artwork. Some are merely hard to read, others are ugly and hard to read. The undisciplined use of type and text here is mysterious, considering how disciplined his line and colouring is. It is possible to have an extremely pleasurable reading if you gloss over parts of this work. The reader knows what the plot arc is from the back cover, so ignore the text (and the humans) and just look at the set pieces as they move by. In that reading, the post-war years with their supposed optimism and domesticity are one of the ephemeral moments of the century, quickly washed away by late century pragmatism. Okay, there is one realized character: a "legendary fish" named "The General", a trope so stale that The Simpsons mocked it a full 20 years ago. I'll be generous and note that General Sherman was a catfish, and The General was a sturgeon. The Aldred Building still stands, and there are lots of great photos online. The excerpt is an establishing view of this building from early in the piece. Kiirstin also reviewed this book at A Book a Week, and we had a short discussion about it which is posted after her review.